I have started and deleted this review several times now because, frankly, I don’t have words that properly do justice to the astonishing piece of theatre I have just had the good fortune to see. I’ll have a good go at it though, because it deserves to have a packed audience and l might just be able to persuade someone to get there this week! I have loved Peter Schaffer’s plays since I was a teen. Well, let’s be honest, I have mainly loved Amadeus, the story of Mozart told by an ageing rival composer. I had the treat this evening of seeing Equus, directed by Ned Bennett, with fresh eyes, knowing little about it apart from its main, horrifying event and that there are horses. It is set in the hospital to which Alan Strang (played by Ethan Kai) has been sent, as an alternative to prison, to be treated by world and life weary psychiatrist Martin Dysart (Zubin Varla). Alan and Dysart, like many of Schaffer’s protagonists are diametrically opposed: heart versus mind; control versus passion. The adults, including Alan’s dysfunctional parents (Robert Fitch and Syreeta Kumar) and Dysart’s magistrate friend, Hesther (Ruth Lass) appear as statues. They stand at times with their feet on symbolic plinths set against a marble effect stage floor. Moments of naturalistic dialogue are often subtly but at times blatantly challenged by the sense of total theatre. White curtains surround the stage like a doctors curtain pulled around a patients bed. Practically, they absorb the striking colours used to reflect the vivid nature of Alan’s nightmares. A haunting underscore of abstract music is so quiet at times that you question whether you have imagined it. At others, it is loud enough to make you jump. The contrast is there throughout. 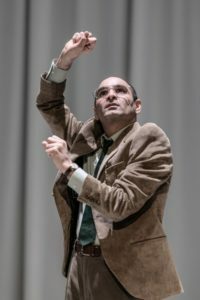 The stylised movement is not only present in the hypnotically beautiful physical theatre of the actual horses (played by several members of the cast but most strikingly by Ira Mandela Siobhan), but both Alan and Dysart cleverly have the physicality of the horse within their gesture. Alan’s arms become tense, fists clench at times of stress. Dysart’s head twists and jolts when under pressure. The play successfully communicates a sense of human vulnerability, a stark contrast to the majestic power of the horse. There is a sense that we are all in pain. We all at times consumed by behaviours we can’t explain. 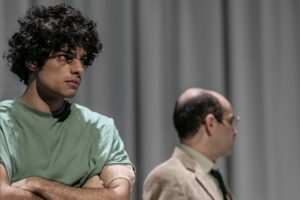 Equus strips away at the characters protective layers and reminds us of our own. Whilst none of us is likely to experience the extremes of existence that Alan does, there is no point at which he does not remain human, vulnerable and ultimately, likeable. Only the extraordinary performance by Ethan Kai allows this. If you are looking for an absorbing and challenging experience, you just couldn’t be disappointed by this production. You won’t find simple answers to the complex questions it raises about the mental health of those who commit violent acts and how they should be treated by the justice system, by doctors and by society in general. But nonetheless, if your response is anything like mine, you will enjoy the process of being made to consider them. A remarkable evening.